Walking along the High Line over the streets of Chelsea on a sunny day, it’s easy to see why the repurposed rail bridge has gained such fervent acclaim in design circles. The High Line is an innovative example of adaptive reuse, made possible by the organized efforts of Friends of the High Line. Despite its triumph as a design project and as a green space in a dense urban environment, the functioning of the park points to flaws in its creation as well as in the city itself. Affordability: The creation of the High Line had an explosive effect on property values nearby the park. Property values skyrocketed after the High Line’s construction, within a couple of blocks of the park’s location. Josh Barbanel reported on this ‘halo effect’ in his 2016 article for the Wall Street Journal. This kind of boom is to be expected near an amenity like a new park, especially in such a dense city. Unfortunately, the majority of housing around the High Line is market-rate, leaving out those with an income that would restrict them to designated low-income housing. 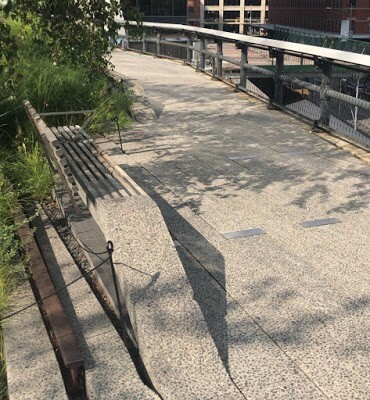 Participation: The High Line’s design process did not effectively include the community because it did not take into consideration how the park could meet local residents’ needs. While there were participatory elements in the design process, the input residents were asked for was not oriented around their needs as a community. The executive director of Friends of the High Line, Richard Hammond, discussed the flawed process and the group’s new approach an interview with CityLab’s Laura Bliss for her 2017 piece on the High Line. 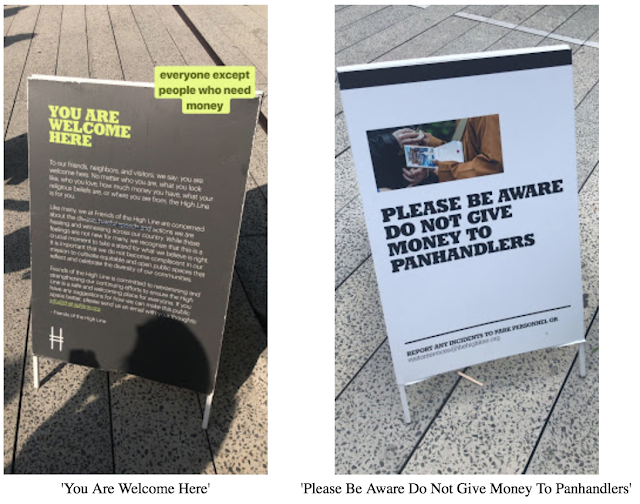 The message of the first sign is essential to ensuring inclusive public space, and is admirably explicit during a time of increasing social and cultural division. All people should be able to freely access and benefit from public space as equal members of a community and a city. Why, then, should the needy be excluded? Why should poverty be criminalized even in spaces that tout philosophies of inclusion? The exclusion of the needy from the public realm can only lead to greater bias against and fear of those in poverty or suffering from homelessness, and prevents communities from the self-reflection necessary for positive change. Andy Merrifield, quoting Marshall Berman, identifies public space as an environment in which “a whole society might begin to confront its collective repressions to call up the specters that haunt it and look them in the face.” One of the specters that residents may be called to face in unrestricted public space is the existence of those in need. Merrifield asserts in his own words that “a democratic and ‘open-minded’ public space would ensure the shock of recognition” of the existence of poor people. Berman calls this confrontation a way to ‘grow up in public.’ Shared space calls on people to truly share their world and bear witness to its realities, however upsetting they may be. Through this confrontation communities can begin to critique and improve their social conditions. If the High Line is yet another tool in the city for policing the homeless and impoverished, attempting to erase them from the public eye and cementing their image as a threat, it can’t possibly serve its community and city as a truly public space. Excluding impoverished people from public spaces denies those people the recognition they deserve as legitimate city residents, while also denying entire communities the responsibility and opportunity of self-reflection and improvement presented by confronting their own realities. Work cited: Andrew Merrifield, Metromarxism: A Marxist Tale of the City, 169–170. 2013.